poverty | A Trip to the "Morg"
A man was murdered this week. A man was murdered at the hands those who purport that they pursue justice. This week was the culmination of a whole system of inequity that claimed the life of an innocent man. And this murder was not the first and is unlikely to be the last of its kind. Let’s not mince words here, Troy Davis was killed because he was black. He was killed because of the racism endemic to the Prison-Industrial Complex. He was killed because of a system that keeps people oppressed and creates slave labor. He was killed because we operate under a system of legalized murder. There was no weapon found, no DNA that matched his and 7 out of the 9 witnesses recanted their statements. It all pointed to, if not innocence, than enough doubt that capital punishment should have been out of the question. But did Georgia give him clemency? No. Would he have gotten clemency if he had been white? My intuition says yes. 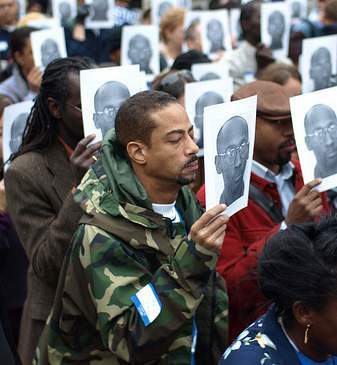 Troy Davis’s case exemplifies perfectly the horrific nature of the Prison-Industrial Complex. The Prison-Industrial Complex has a history of convicting and imprisoning more people of color, poor people, young people and queer/trans people than their straight/cisgender, more affluent, older and white counterparts. Moreover, people in prisons are oftentimes treated without respect and dignity. They are confined in tight spaces with very little freedom to move about. They are more often than not the last to get evacuated in natural disaster situations, if they are evacuated at all. People who can’t afford bail are trapped in jails even though they have not been convicted of anything. Trans people specifically are denied the clothing of their corresponding identity and are placed in cells with people of their birth assigned gender. They are also denied access to the hormones that they might want and are either address with incorrect pronouns or with epithets or both. On top of that, there is often a very strong police presence in low-income communities and in communities of color and people who live in those communities are often suspected of wrong doing even when they aren’t doing anything. Not only that but the police have a history of using excessive force on people who aren’t older, white, straight and affluent. How many times do we hear about another police officer brutalizing a young person of color and not having to face any reprisals? And a lot of this oppression is motivated by capitalism. It is motivated by a desire to make money. Not only because prisoners are forced to do slave labor, but also because prisons are being privatized. As this privatization occurs, more and more people are convicted to populate these prisons which then increases the company’s profit. At the end of all of this violence is capital punishment. Capital punishment is the culmination of this great big hate machine. It is the final act of violence. The final act of a depraved and dehumanizing system. Capital punishment is both morally repugnant and degrading to all people involved. It does nothing but continue the cycle of violence that many people are born into. Moreover, it does little to prevent crime. This is because negative reinforcement is much less effective than positive reinforcement. And it doesn’t get much more negative than capital punishment. Capital punishment does nothing to “rehabilitate” the prisoner. It adds nothing to the fabric of society. It can only take away. It is expensive and ineffective. Aside from all that, however, is the fact that killing is always wrong. Let me repeat that. Killing is always wrong. It doesn’t matter what the person in question did or what they will do, killing for any reason is wrong because that person is still a person. This is the fact that I want to drive home, people who commit crimes are still people with hopes and dreams and fears. They are still people who experience suffering and joy, love and hate. They are people who’s dignity must be respected. The minute we dehumanize someone is the minute we think that we can do as we like someone. We must always remember that humans never lose their humanity. Moreover, capital punishment does not address the underlying issues why crime occurs. It does not treat the cause, it merely ineffectively treats the symptom. If you want to reduce crime, reduce poverty.